OMIC (“we” or “us”) is committed to keeping your personally identifiable information private. This privacy statement describes how OMIC uses information we collect about you through our website and how we use your email address to communicate with you. It also explains the choices you can make about how we use your information and email address. OMIC is the sole owner of the information collected on its website. This privacy statement applies only to information collected by this website. As is true of most websites, each time you visit OMIC’s website, we gather such information as your domain name, your internet protocol (IP) address, and your browser type, and store it in log files. Our server software also records how often you access our web pages. In addition, in order to reproduce your information on the Application Downloads Request Information Form and thus save you the trouble of re-entering it upon a subsequent access of the page, we do link information that we store in a cookie to personally identifiable information that you submit. You can remove the cookie by following the directions provided in your Internet browser’s “help” file. We use this information internally to show aggregate activity and determine potential trends in web site usage. OMIC shares this information only with service providers used to administer our website and to provide us usage information. In order to request information from OMIC or to access certain pages on our website, you must provide some personal information, including your contact information (e.g. your name, address, and email), Academy membership or other identifying information (e.g. your AAO ID), and insurance policy information (e.g. your policy number and expiration date). We use this information to verify your identity and eligibility and to process or respond to your requests. We may also use this information to update OMIC’s records. All information submitted is used only for OMIC’s business purposes. OMIC shares this information only with service providers used to process or respond to your requests. For example, if you request information about a life or health insurance product, we will share your contact information with Marsh Affinity Group Services, which coordinates the Academy/OMIC life and health insurance program. We do not give your personally identifiable information provided to us online to third parties for commercial purposes or for any other reason not disclosed in this statement. We will never use or share this information in ways not described in this privacy statement without also providing you an opportunity to opt-out or otherwise prohibit such use. If your email address was voluntarily submitted to OMIC, in addition to using it to respond to your online requests, we may also use that email address to send you alerts, updates and announcements about your insurance with OMIC, including, but not limited to, underwriting and risk management information. OMIC shares your email address only with service providers used to process or respond to your requests, as explained above. Otherwise, OMIC does not share your email address with any third parties. contacting OMIC as indicated below. If your personally identifiable information changes, you may edit this information either through the OMIC website or by contacting OMIC as indicated below. We use generally accepted industry standards to protect the personally identifiable information we obtain about you through our website. Using a popular and reputable methodology, we are able to securely and reliably encrypt all information you provide to us. This makes it exceedingly difficult for unauthorized intruders to read any transmitted data. However, no method of transmission over the Internet, or method of electronic storage, is 100% secure. Therefore, while we strive to protect your personally identifiable information, we cannot guarantee its absolute security. The privacy practices described in this statement are OMIC’s only; we are not responsible for the privacy practices of any companies whose websites are linked to or from the OMIC website. We encourage you to be aware when you leave our site and to read the privacy statements of all other websites. We reserve the right to modify this privacy statement at any time, so please review it frequently. If we make changes to our privacy policies or practices, we will amend the privacy statement to reflect those changes and post the revised version on our website. 655 Beach Street San Francisco, CA 94109. OMIC, not the Academy, is solely responsible for all insurance and business decisions including coverage, underwriting, claims and defense decisions. #4. Largest insurer in the U.S.
OMIC is the largest insurer of ophthalmologists in the United States and we've been the only physician-owned carrier to continuously offer coverage in all states since 1987 (pending in WI). Our fully portable policy can be taken with you wherever you practice. 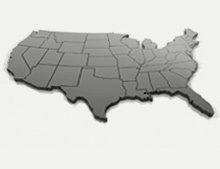 Should you move to a new state or territory, you're covered without the cost or headache of applying for new coverage.